The Appointment class represents a single piece of data that is visualized in the RadScheduleView. Each Appointment has various properties such as Subject, Start, End, TimeZone, etc. You can also assign Resources, Categories and TimeMarkers to the appointments. 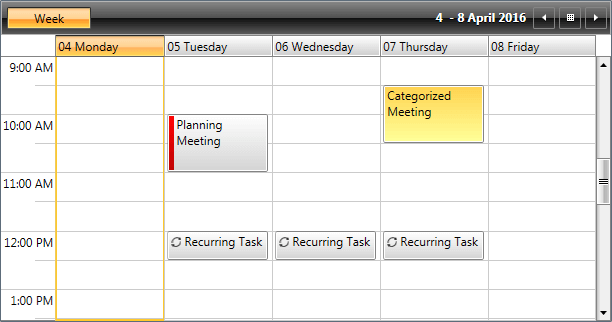 Additionally, RadScheduleView provides the functionality to configure repeating appointments. The user has the ability to apply recurring scheduling patterns such as daily, weekly, monthly or set a range of recurrence from date to date.